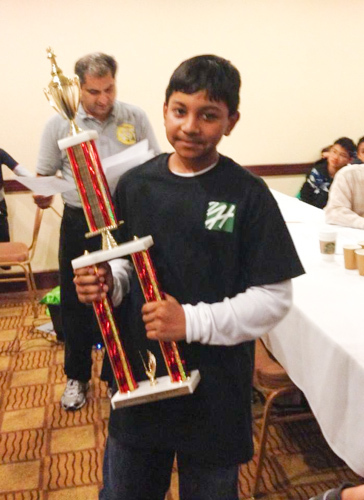 Shafieen Ibrahim, grade 7, finished in first place among players rated “under 1300” at the California Class Warfare Championship chess competition, hosted by Bay Area Chess Nov. 30-Dec. 1. He took home more than $400 for his hard-earned victory. Just before Thanksgiving break, grade 3 students Rahul Mulpuri, Dominick Piscione and Grant Sims won first place in the Project category at a First Lego League robotics tournament. The team, the youngest in the tournament, was chosen from 24 competing teams.